This week has been full of outdoor play. It is so liberating to be able to go out in the fresh air without getting either wet or blown away! I am also pleased to say that, at last, we are getting back to our usual healthy, bug free selves! Joseph went back to school on Monday so this week we have been getting back into our weekly routine. Monday was a day full of jobs. I spent the whole day cleaning and doing housework. After being ill and having the hubby home I put chores to one side so that we could spend some quality time together, which we all thoroughly enjoyed. It just meant more work trying to catch up, but it was worth it. It wasn't until the kiddies were all in bed and I sat down, I realised I had not taken a single picture! 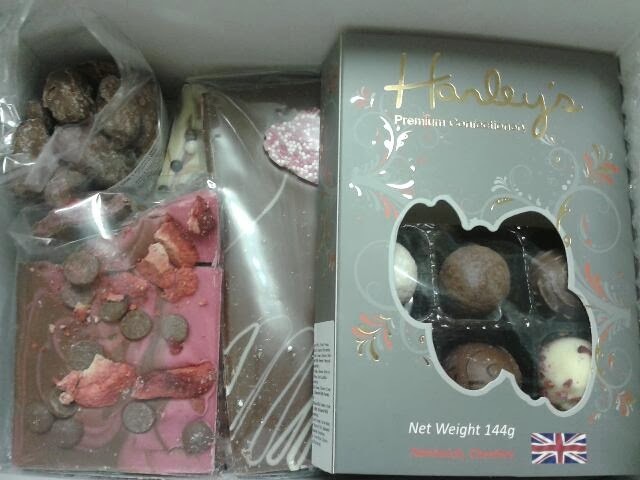 So for all of my hard work I treated myself to some of the delicious Hanley's chocolate that the hubby got me for Valentines day! At last, a sunny day! 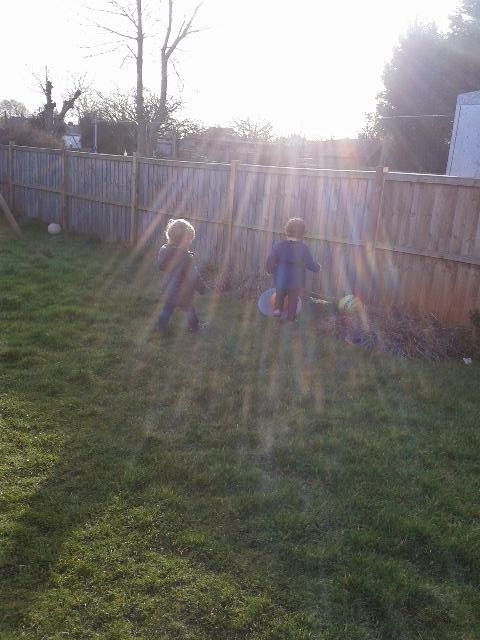 This morning, after we had taken Joseph to school, the twins explored the garden and enjoyed their new found freedom! When it was time to go in, it took a lot of persuading and after a tantrum, and a little longer in the garden, I managed to get them inside. These two are going to love playing outside, just as their big brother did at that age. As soon as we got back from the morning school run the twins wanted to be out in the garden again. At last we have some signs that spring is just round the corner. 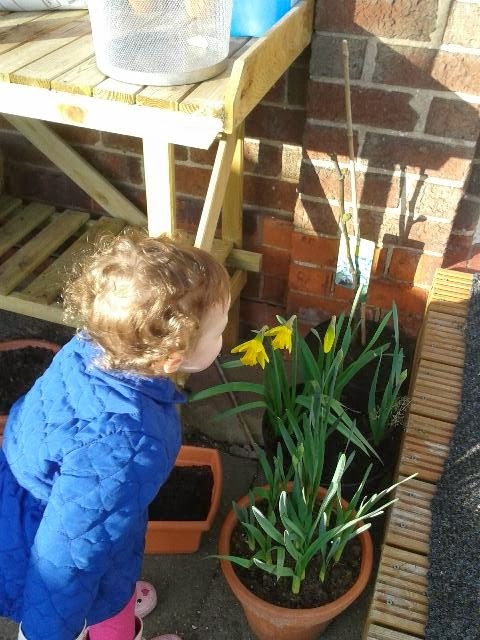 Isabella found the daffodils today and kept shouting excitedly "Look! Mummy! Flowers!" she'd run up to the daffodil, sniff it, say "Urrrrr" run off, then do it all over again! The twins got these colour matching activity boards for Christmas which we put away. When I was getting them both ready for bed on Thursday night Isabella found the peg board and brought it over saying "this mummy". When they had their pj's on and we were waiting for hubby to bring the milk up I sat with her while she had a go. 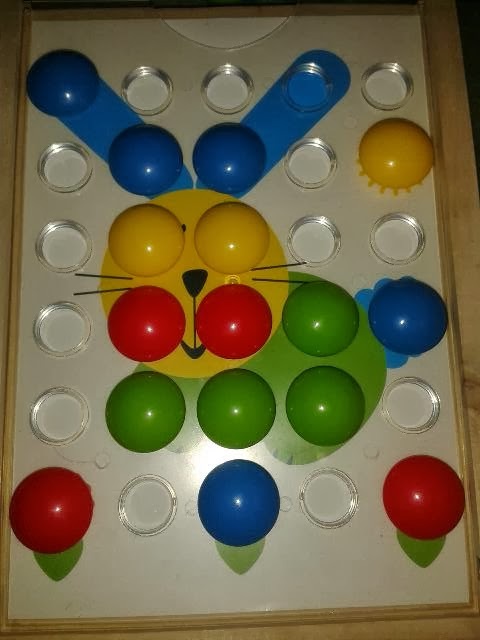 I was astounded that on her first go, she knew where each and every peg went without me needing to tell her or correct her! I can't believe how much they are growing. They really are coming on in leaps and bounds! The twins are certainly growing in confidence! After trying all week, on Friday, they mastered climbing up the steps, sitting down and sliding down the slide on their own. There really is no stopping them now! 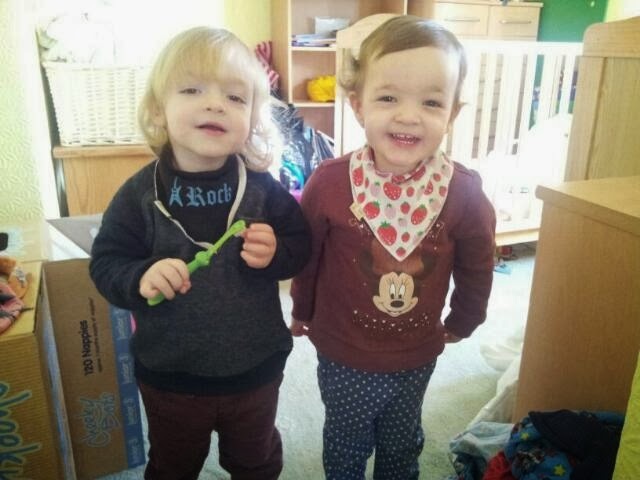 While I was out with Joseph in the morning I received the picture of the twins from hubby. These days it is so hard to get them to both stand still together for a photograph. This picture made my heart fill with pride and even though I didn't take it, I had to share it! All 5 of us enjoyed some garden time on Saturday afternoon. Hubby started doing some gardening jobs and tidying up after the winter while I played with the kids and snapped lots of pictures! When Joseph saw that the twins could do the slides on their own he couldn't resist joining in which was lovely to see. He is such a great big brother and really does dote on them! They certainly think the world of him too! This week, my Silent Sunday picture, really does sum up our week. Lots of out door play and new experiences for the twins! 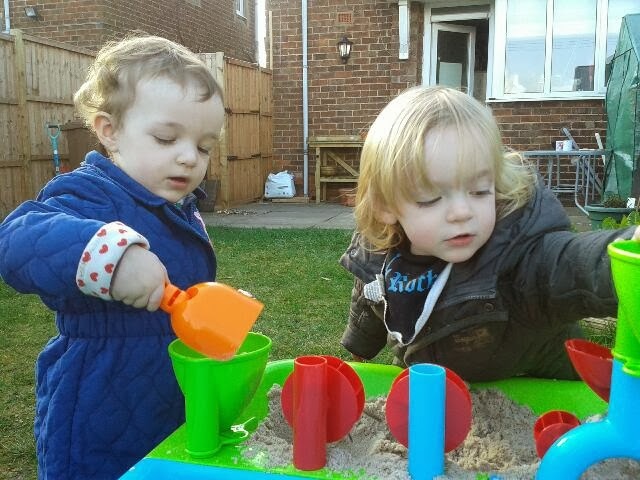 For their birthday one of their auntie and uncles bought them a sand and water table. Hubby put it all together for them and filled one half with sand. They loved it! Their hands were in and the spades were out. When the weather gets warmer they will also love the water but for now they are having so much fun with the sand! We have had such a lovely week and have been lucky to have more spring like weather. I am just hoping that it is here to stay as I now have twins that want to be outside at every available opportunity! I love Tuesdays shot, it looks like the sun is shining only on the twins. Great seeing them enjoying the garden! I love the one of her smelling the daffodil! It was a great week, just hope the nice weather stays! It has been lovely seeing the sunshine this week hasn't it. Hope you enjoyed your chocolates! It has been great and I hope we have more weeks like this! Isn't it fab to finally get outside? 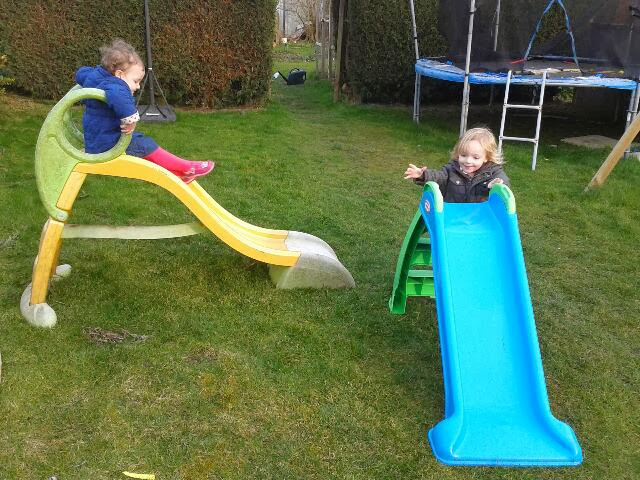 Makes everything seem so much better :) The twins look like they're having so much fun on their slides! a garden is a godsend with children, my son use to scream holy murder when I brought him in to bath him in an evening. I think it is lovely when siblings get on with each other and the younger ones dote on the bigger ones. Love your comments on her sniffing the flowers, so comical. What a lot of lovely outdoor photos! Arrr bless :-) its lovely to see the daffodils flowering it certainly feels like spring is coming! 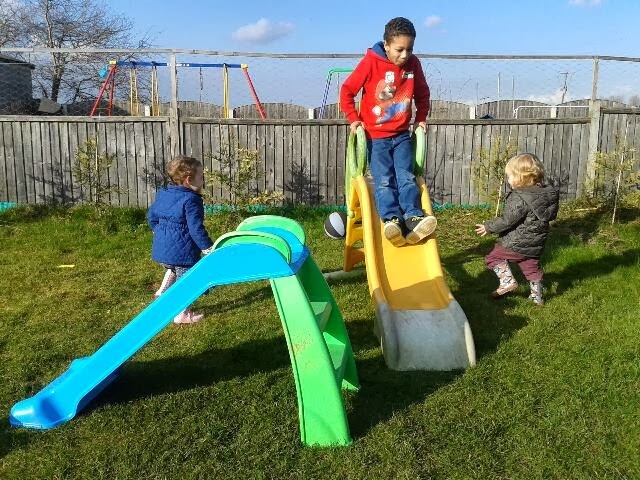 Gorgeous pictures - they are enjoying some lovely bright colourful play and there'll be lots ahead with a great big brother joining in like that - top week! Thank you :-) looking forward to more weeks like that one! Those chocolates look lush!! And it is so good to be able to get outdoors in the sun finally isnt it?